beIN Sports HD 2 Max is encrypted again after being temporarily unencrypted on 11012.00MHz, pol.H SR:27500 FEC:2/3 SID:2006 PID:461[MPEG-4] /462 Arabic,463 Arabic,464 Arabic (Irdeto 2 & VideoGuard). A new channel has started in DVB-S2 Clear: beIN Sports HD 2 Max (Qatar) on 11012.00MHz, pol.H SR:27500 FEC:2/3 SID:2006 PID:461[MPEG-4] /462 Arabic,463 Arabic,464 Arabic. A new channel has started in DVB-S2 Irdeto 2 & VideoGuard: beIN Sports HD 2 Max (Qatar) on 12729.00MHz, pol.H SR:27500 FEC:3/4 SID:5502 PID:621[MPEG-4] /622 Arabic,623 Arabic,624 Arabic. BeIn: New PID for beIN Sports HD 2 Max: PID:461[MPEG-4] /462 Arabic,463 Arabic,464 Arabic SID:5307 (12245.00MHz, pol.V SR:27500 FEC:2/3 - Clear & Irdeto 2 & VideoGuard). 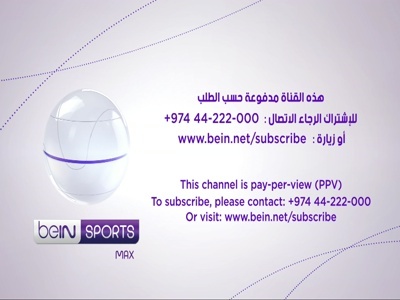 BeIn: beIN Sports HD 2 Max is encrypted again after being temporarily unencrypted on 11623.00MHz, pol.V SR:27500 FEC:2/3 SID:10806 PID:591[MPEG-4] /592 Arabic,593 Arabic,594 Arabic (Irdeto 2 & VideoGuard). BeIn: A new channel has started in DVB-S2 Clear: beIN Sports HD 2 Max (Qatar) on 11623.00MHz, pol.V SR:27500 FEC:2/3 SID:10806 PID:591[MPEG-4] /592 Arabic,593 Arabic,594 Arabic.